I was going to say “it has been a good day so far,” but I don’t want to do that. I don’t want to say that the rest of the day could possibly ruin how awesome the morning was. And I do believe that the awesomeness of this morning is magnified by how great last night was as well. Because of a very dear friend coming over last minute, we were able to get out as a couple without Evan for two hours. Now, that doesn’t sound so enormous- we do try to get date nights scheduled at least once a month. But one thing that I feel is really lacking in our marriage lately is social outings with friends. We have tons of them on the calendar, but we go as individuals while one of us stays home with Evan. Realistically speaking, we just can’t and don’t really want to have sitters multiple times a week. So if our church plant is having a prayer meeting, one time I will go, and the next time, Todd will go. If there is an adults only party, either we won’t go at all, or just one of us will. 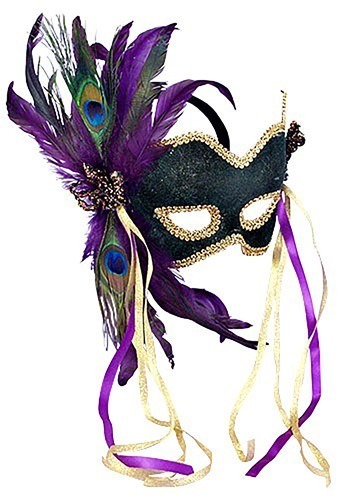 But last night, our friends Jim and Emily (new pastor and wife of liberti Collingswood) had a Mardi Gras party. And we were able to go, wear beads and masks (well I wore a mask), and have some good food, drink, and conversation for a few hours. Even though outings like this are not intimate time for us; we typically mingle separately and then check back in a few times before departing. I think it is so great to experience a celebration, and then get to talk about it on the way home and share the experience. We came home to a sleepy and happy Evan, who had played happily with my friend Wendy and barely noticed we were gone. I was carrying him upstairs to bed, and I actually took notice of the way my chest felt, and I felt so full, peaceful, like my soul had been fed. So that brings us to this morning. I have been singing “Ba Ba Black Sheep” with Evan a lot the last few days, it really wasn’t one in my regular repertoire, mainly because I always would forget the words and sort of make them up. My Aunt Camille was watching Evan recently and said she sang it with him a lot and that he liked it. Thus, it is part of our regular routine. Just in the last two days or so he has started to do the “ba” sound, the ee sound for sheeep, and the ooo sound for wool and full while I am singing. He did it over and over this morning and I managed to catch the better part of it on camera. Evan is not directly in the shot, because I didn’t want him to be distracted by the phone. This is such a huge step for Evan. He recognizes the sounds in the song and he consistently will put them in the right place when I sing it. It will calm him down at the drop of a hat too. If he is fussy, I can simply start singing, “Ba, Ba, black sheep…” and he will say hmmmm and stare at me and wait for me to continue. This video makes me so happy. It is reminiscent of the “whee” video for me. Click here to revisit that big moment. Mama, I don’t want to go! The other big moment of the morning was when I took E to the park. We walked around a bit with the stroller and it was starting to feel pretty chilly and I wanted to give him some time on the swing before heading home. So I pushed him on the swing for about 15 min while he babbled to another little boy next to him and I chatted with a grandmother. Then we tried out the slide that used to scare him, and he went down it about 5 times, reaching out to go again and again each time. As I said goodbye to the family and started walking to the stroller to leave, he started whining and crying and then fought me as I put him back in the stroller. For a second I really was confused and was wondering why he was crying. Then I realized, he is having a completely appropriate reaction! He doesn’t want to leave the park!! He is having so much fun that he is telling me he wants to stay. Oh my goodness, my heart swelled. The poor kid was purple in the face, crying and writhing in frustration and I couldn’t help but smile. He was being a toddler and I couldn’t have been happier. And he immediately looked at me with those blue eyes glistening with tears and mumbled mmmm and weakly smiled. And just like that, he was calm again and waiting for his favorite song to continue. I Will Sweat the Small Stuff. First of all, I cannot believe my blog viewings is almost up to 5,000. I remember when I first started, over two years ago, and I would just fill out little pregnancy update surveys. I think maybe 3 people were readers, if that. Now, I have readers in Scotland and Germany and all over the US. Possibly other locations, but I am not sure if I can always believe the locator in the Blogger program. 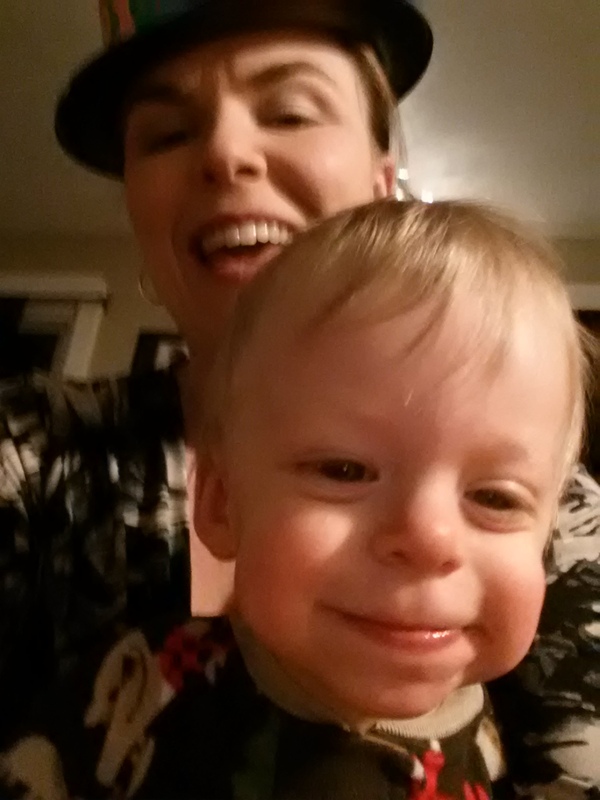 I am so humbled that people want to spend the time to get to know me, my son, and my family. I am truly honored. Our little victory today was breakfast. Evan ate pieces of a waffle with peanut butter. ATE them. Made a mess, and had some “loss” as his speech therapist calls it, but he ATE plenty of it. And reached out for more. Sticky, gooey, hard to chew, and soooo delicious- peanut butter. I stopped by my work today to drop off some things and my friend asked me how we were doing. I mentioned that this morning Evan ate peanut butter on his waffles and she laughed in delight and said, look Evan, see how happy you are making Mommy?? I didn’t even realize it, but I was grinning from ear to ear. Orange, Evan’s favorite food group. As you all know, our biggest struggle with Evan has been his eating, and lack thereof. 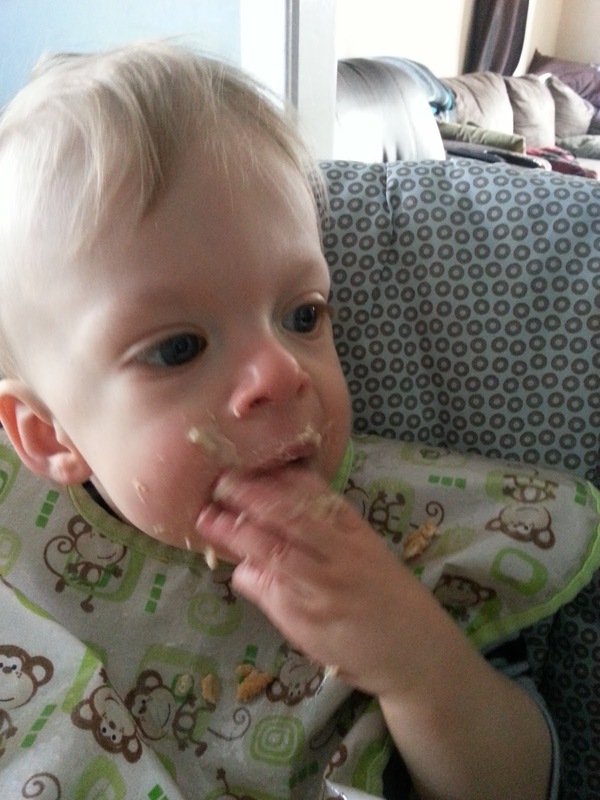 When I started baby food with E, he loved it. I was making it myself, and he enjoyed the few different things that we tried. But then after about a month, he got sick with a sinus infection, and then the vomiting episodes started, and we could barely get formula into him. He was drinking 2 oz at a time, and we had to handle him with kid gloves all the time for fear he would vomit everything and anything we had managed to get him to consume. 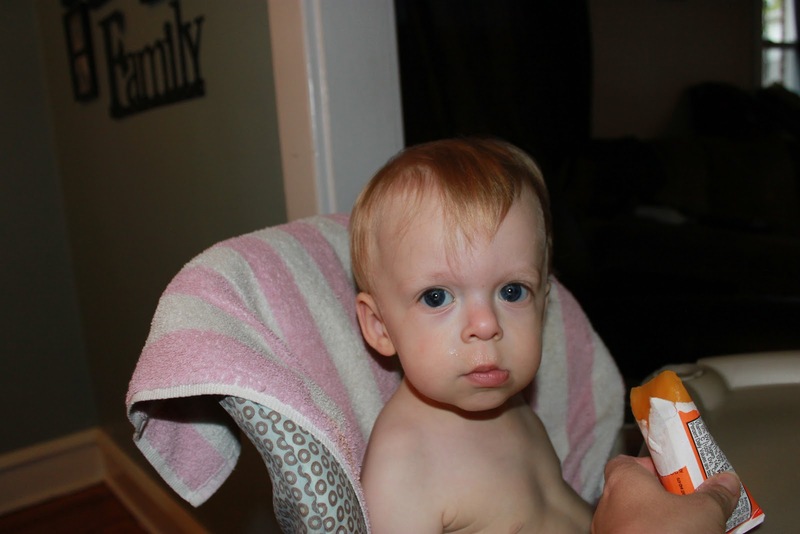 He suddenly did not want any type of baby food as well, and he would only eat store bought Gerber sweet potatoes. 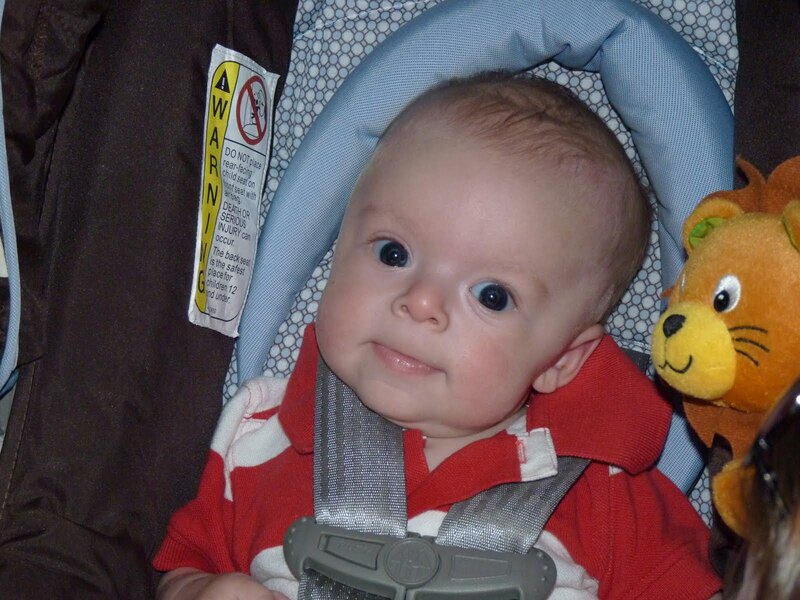 This continued for a few months, which led us to the CHOP feeding team- which led to his diagnosis. This is how I feel about frozen orange pops, Mama. First happy experience with a cookie! This is good for my face muscles, Mommy! 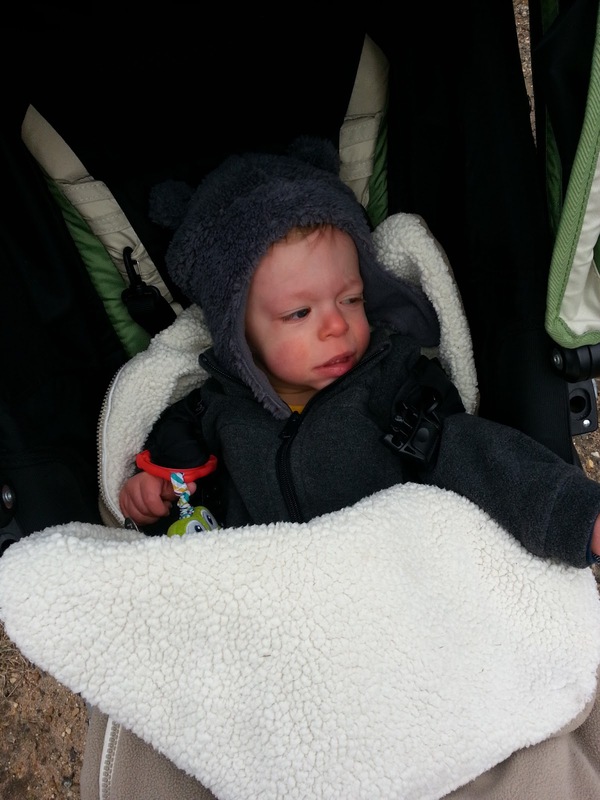 Anyhoo……since May when we found out he has Williams Syndrome, and that reflux and feeding issues go along with the territory, we relaxed a little, because we thought we were missing something that we should have been trying. Over the summer we got him on new reflux medicine that is spread out throughout the day, and we slowly started to reintroduce baby food. Any attempts with solids were promptly pushed away or caused gagging/vomiting. 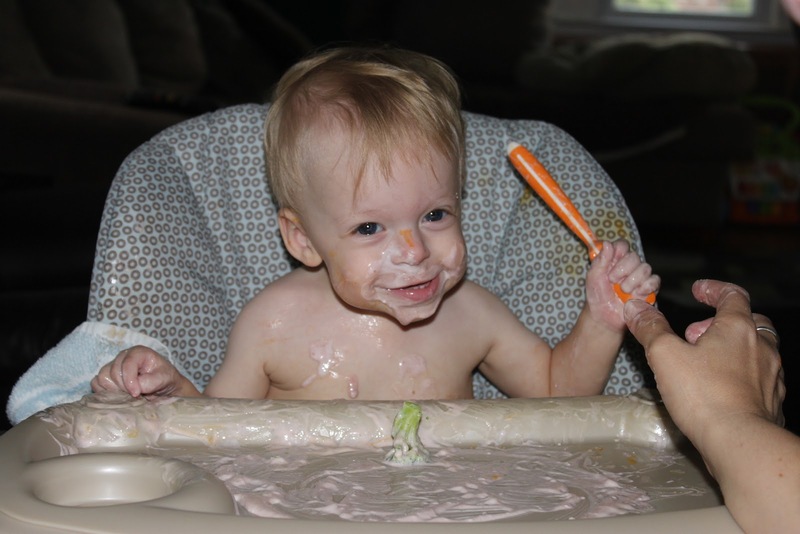 I took the advice of an OT friend and let him play with his food, spreading yogurt around the tray with broccoli, and getting the baby food all over his face. He did have fun, but many different textures even when just placed in front of him, made him gag. We are not sure if it was purely sensory of the memory of how sick food was making him back in the spring. We’ll never know for sure. He slowly started to drink more ounces at a time, and eat small amount of baby food here and there. 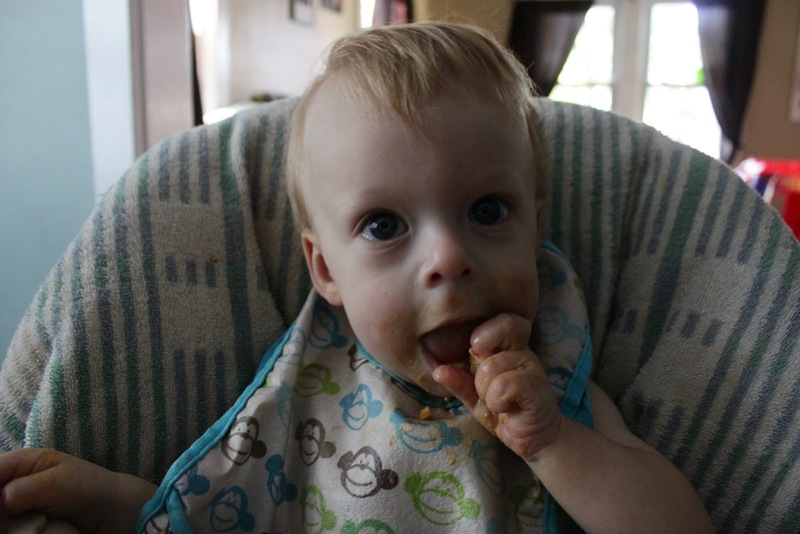 In July, we found that he would eat cookies as long as they were big enough for him to pull in and out of his mouth so he had control the whole time. I was over the moon about this breakthrough. He wasn’t “really” eating it in the sense that you or I eat things. But he was putting it in his mouth without gagging, and reaching for more. 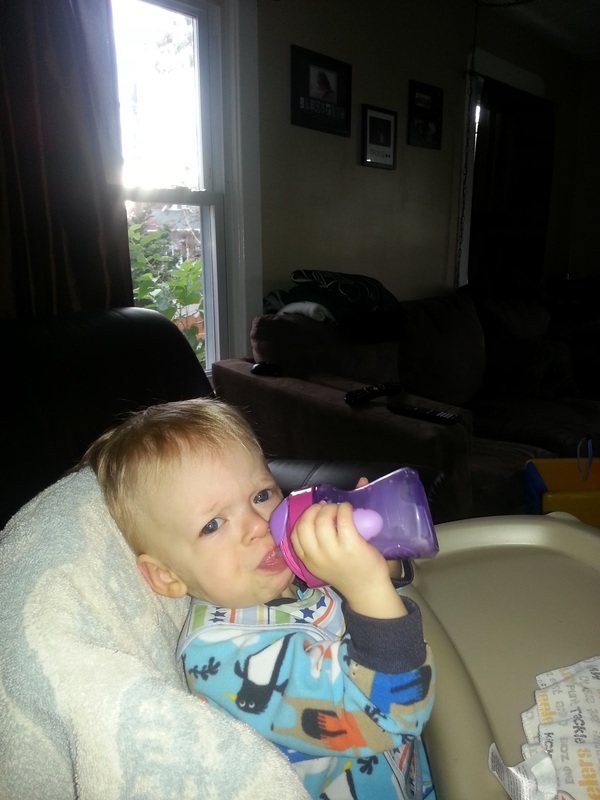 Slowly, over time, he increased his intake of purees, and added more and more ounces of his pediasure/duocal mixture. Then he mastered the straw! 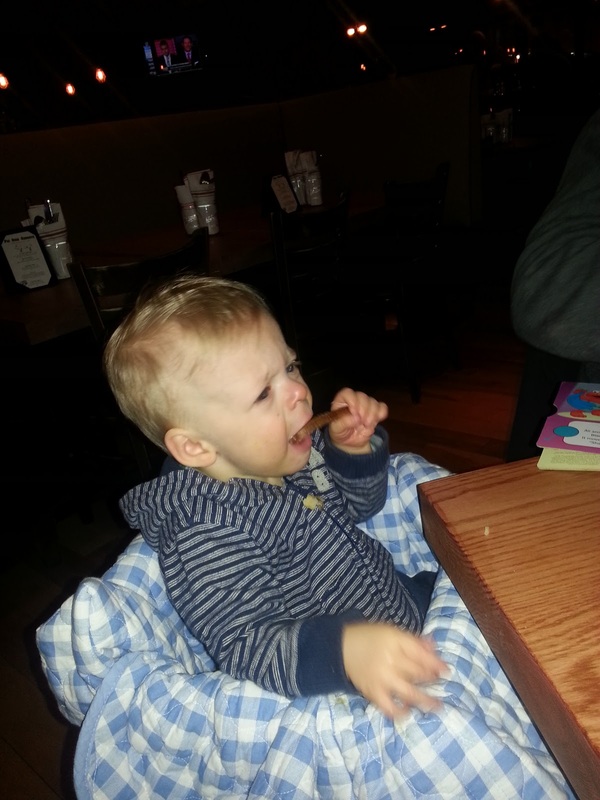 This was huge, as we have been told by his speech therapist and others that drinking from a straw will only help strengthen his weak facial muscles and help him to “feel” his food in his mouth better. In the past month or so he has tried: buttered waffles, cheerios, meatloaf, cheeseburger, cereal bar, hummus on crackers, kernels of corn, Thanksgiving stuffing, buttered pancakes, chicken nuggets, regular and sweet potato fries, the list goes on. But the way I look at it, he was vomiting everything profusely no matter the circumstance, then he progressed to gagging when it sat on his tray, then to at least touching it, but gagging, then trying it in his mouth and gagging, to now, putting it in his mouth, chewing, and sometimes swallowing! Definitely progress. We are hoping our speech and OT therapists can help out with this. Lou-Ville is just around the corner!!!!! “It’s not what we eat but what we digest that makes us strong; not what we gain but what we save that makes us rich; not what we read but what we remember that makes us learned; and not what we profess but what we practice that gives us integrity.”- Francis Bacon Sr. Anyway, moving on to Evan and all the fun things he is doing!! First of all, he has experienced some exciting things in the past month including but not limited to… a hurricane named Irene, an earthquake (that his mommy didn’t feel because she was rocking him to sleep, a trip to the Hershey Museum and Chocolate World, and walking in a charity walk. Evan is such a big boy, he is rolling over from belly to back and back to belly. He goes in a complete circle in his crib, and I have gone in to pick him up numerous times to find him on his belly. He had been sleeping 6 hours and then 3 hours after one wake up over night, which we were very happy with! Recently he started waking up twice again but then last night he slept for 8.5 hours! A record! I am trying to increase the volume of milk he drinks which can be a struggle but the past two days he has done much better. Praying for another long stretch tonight! He is grabbing at everything, his toys, the mobile on the swing, Daddy’s glasses…you name it! He can sit in his bumbo chair playing with a toy while I clean bottles or get dinner ready. He smiles and laughs, and sticks his little tongue out while doing both. 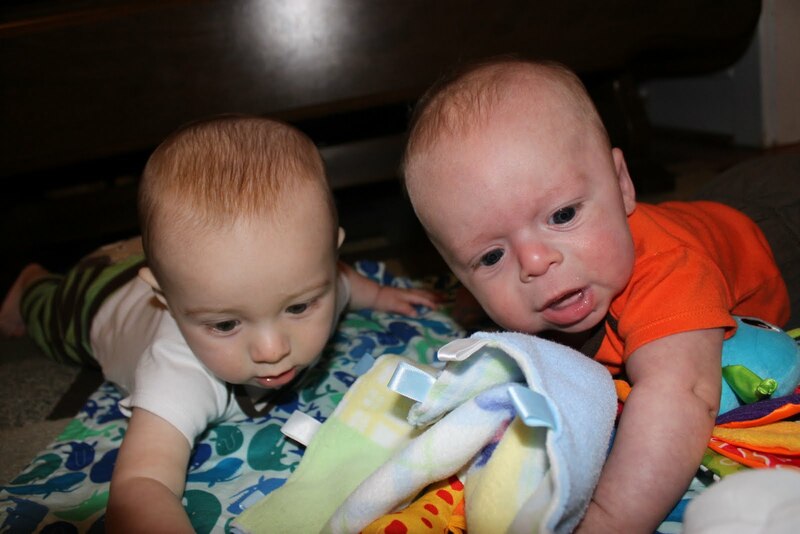 Oddly enough I still think his favorite place to be is on the changing table! He just smiles and giggles the whole time. He also can sit for multiple book readings now. Which makes me VERY happy. 🙂 My two favorite things right now, are holding him and singing while he is falling asleep, and listening to him “talk” while he is drinking his bottle. He sounds like he is having a complete conversation with me while drinking. It is so precious. Better get to sleep, in case he is up in a couple of hours. 🙂 Thanks again for reading! Hello everyone! So sorry for the length between blogs, but it might be more like a monthly thing now that the little man is in my life. It has been such a whirlwind, these two months. Evan has permanently changed our lives for the better. He is so perfectly precious and amazing. Today he officially turns two months old. He just started to make little smiles this past week, which warms my heart. I have spent a a lot of time with my mom this past week which also warms my heart. 🙂 She has taught me a bunch of things about being a mommy that I never would have known if I hadn’t been able to hang out with her. I feel so blessed by all of Evan’s grandmothers. They are so wonderful. My mother in law, Sara, helped out a bunch this past month and she was an invaluable influence on me and Evan. Mom Mom Debbie is going to babysit Evan this weekend for our first little outing to a Phillies game. So blessed we are to have all these ladies in our lives. I was reading over my last blog and I mentioned getting 4 hours of sleep one night…well I am happy to report that Evan is now sleeping an average of 4 hours at a clip and then 3 or so for the second clip. 🙂 We are moving towards a full night’s sleep I think? Maybe? Last night he turned himself completely in a circle in his crib. He is such a little squirm. My mom is always saying he is going to give us a run for our money when he gets a little bigger and I tend to agree. He is already moving so much for only two months. We have his second month check up next Sat, so I will update with his stats then. I predict he will be approximately 12 lbs at that point. He is a good eater and he seems to be a bit longer too. We are just feeling so lucky and smitten with our little guy. Sorry to gush! What I want to remember…. 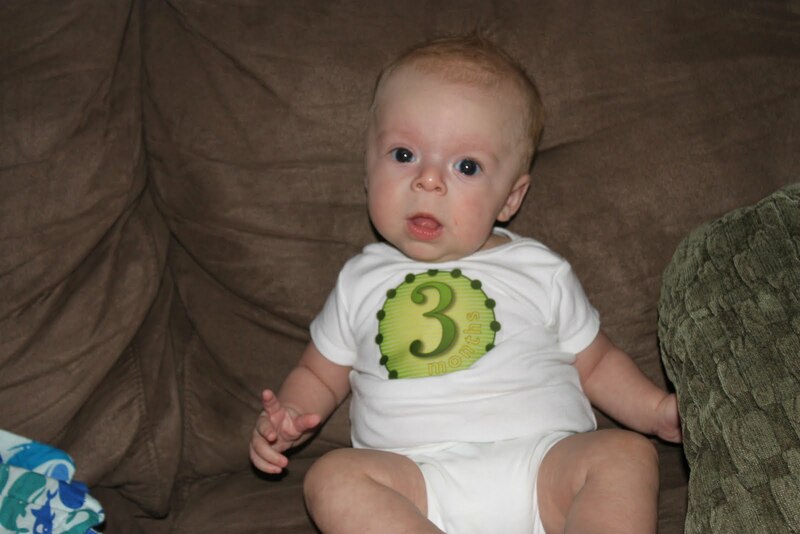 Evan turned a month on Monday and I can hardly believe it! I was going by weeks, and thought he turned a month the previous Friday but Daddy T set me straight. We have his one month check up tomorrow and I cannot wait to hear how well he has grown. -The first moment I saw him all blue and wrinkled and I heard his little cry. I have never felt such relief and joy in my life. The day I married Todd and the day I delivered Evan are definitely the two happiest days of my life. -When he was given to me on my belly for the first time and I held him. I just couldn’t believe that he was the same little guy that was in my belly all those months. -When we found out that he was coming back up to our room in the hospital after he had been in the ICN for 24 hours. That feeling was amazing. We were jumping up and down so much that the nurses had to laugh. They were happy for us too. Evan was a fighter from day one. -Watching Zoey interact with Evan for the first time and how adorable she was with him. She loves her little brother. 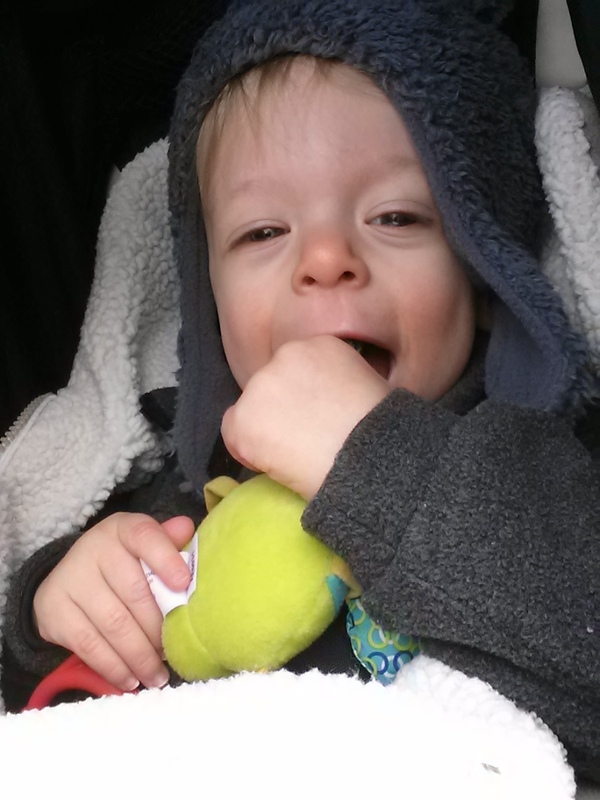 -The little squeaks and creaks that Evan makes when he is waking up or when is sleeping- especially in the car seat when we take walks or drives. I always think he is starting to get up but it is just him moving about in his sleep. – The one time he slept for 4 hours straight!! Can’t wait for that again! – Just looking at Evan’s perfect face. I can’t believe how perfectly created he is by God. His little button nose, his bottom lip that sticks out in a pout, his gorgeous stormy blue eyes. How blessed we are by him. -When he suctions my face or arm when he is looking for food. It sort of looks like he is kissing me, but I know better, he is hungry! -the 4+ weeks I spent nursing him- those were precious moments of bonding that I will never forget. Such a good little eater. -Watching Todd hold him on the couch when he has Daddy time. Todd is the best swaddler! -Our daily walks together, I love getting out first thing in the morning with Evan. Sometimes he is awake and alert but most of the time he takes a little nap while we walk. Thank you to Wendy, Kate, Caitlin, and Sara Jane for joining me on different occasions. It is so nice to have company! 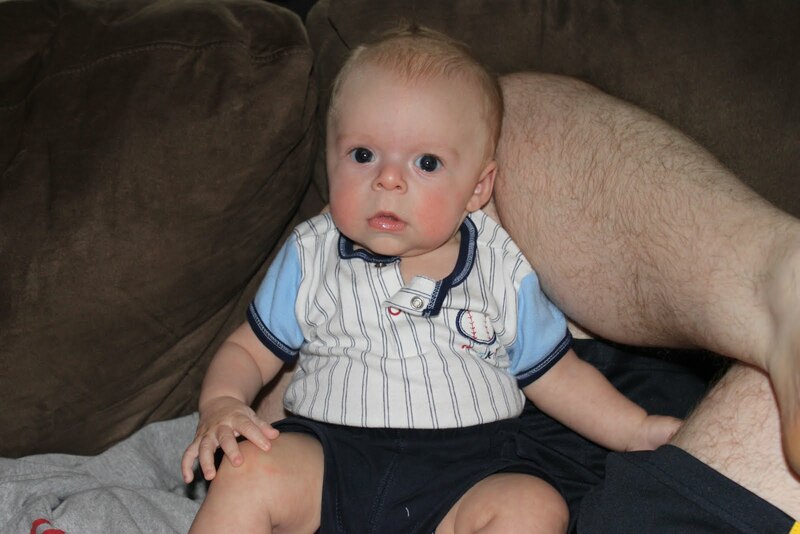 -Watching how he grows every day- his little belly pushes his diapers to the limit! -When he napped in the bassinet for the first time, I was so proud that he was able to do that, I hope he does just as well in the crib! -Reading our first books together. I know he doesn’t really know what he is looking at, but the one time he did watch me talk the whole time and I just loved seeing his little eyes focusing on my face. -His “debonair face” Todd named for him. He scrunches his forehead into little wrinkles and Todd always says, “Oh I need to go get my monocle and ivory tipped cane….” He does this face in his sleep most of the time. -When he can hold his head up so we can do more fun stuff at home during his awake time! I keep saying that I do not want to wish away this newborn time, but Todd and I both are excited to watch Evan grow and do more things every day. I have had a few people say, oh you will find yourself wishing for the days when he just laid around and you could take him everywhere, etc. Maybe, I hope we can find things to enjoy at each point. 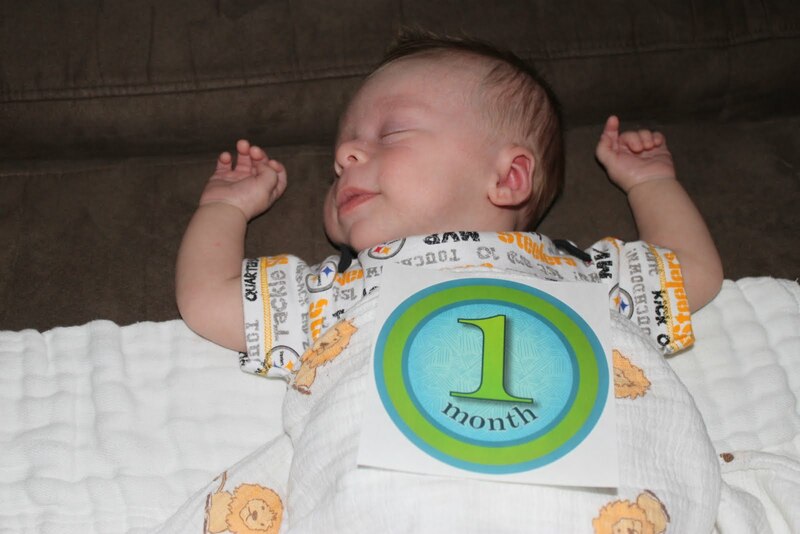 Ok I think the little guy is getting up from his nap and will be wanting his meal I am sure 🙂 I’ll leave you with the picture I took today of him with his one month sticker. It is not the “official” one. Todd and I will take that one together.